Back in 2015, we were writing reviews of EdTech product for the ELTjam blog, and we discovered something of a trend: Products from EdTech startups tended to use technology effectively and have a well-thought-through user experiences, but generally lacked a solid pedagogical foundation and were filled with poor content. Conversely, digital products from established educational organisations had the opposite problem: well-considered pedagogy and effective content but a poor user experience and use of technology. We termed this the Ed-Tech disconnect and it got us thinking about what learners really need from their digital products and services for education and this led to our focus over the last few years on what makes up a great digital Learner Experience (LX) and the process of designing these experiences (Learner Experience Design, or LXD). LXD underpins all of the work that we do on digital product development, and we think of ourselves as learner experience designers. About a year ago, I got talking to Zahra Davidson at an ECHO event that we both attended. She was describing her organisation, Enrol Yourself, and the work she does in facilitating sustainable, impactful lifelong learning through peer-to-peer, face-to-face Learning Marathons. It transpired that Zahra also describes the work she does as Learner Experience Design and that despite working in very different areas within education, this was a label that appealed to and worked for us both. We thought about where the overlap was in terms of best practice for our digital context and her physical one, and wondered how many other people might benefit from this label and the shared body of knowledge that could come with it. From this discussion came the idea of starting an LXD Meetup group to bring people together and discuss these questions. Over the last six months we have run three LXD Meetups in different places in London and what we’ve learned has been fascinating. We’ve realised how much more there is to know about LXD and how helpful it is to share experiences and ideas with others in the group. This post looks at five of the key things we’ve learned already. Learner Experience Design (LXD) is the process of consciously envisaging, creating and delivering opportunities for effective and engaging learning experiences, wherever they might take place. The field of LXD encompasses an understanding of what contributes to the design of successful LX in different contexts, the ways in which we define and measure success, the philosophy that underpins the design and the skills to implement the experiences. skills, knowledge, understanding, attitudes, world views etc. You can see the working definition as well as output and notes from all previous meetups on our Realtime Board. What is the philosophy of learning that underpins LXD? How accessible and inclusive is the LX? Where and when should learning be personalised? What are the design principles we adhere to most? Do these things have a right or wrong answer, even in a specific context? While these are all things that we had considered at different times in the work we do, framing them within LXD has had a profound impact on how we see the field and the impact it can have in helping create better LX. 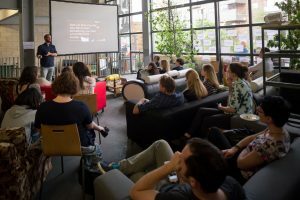 The second meetup we did, at the FutureLearn offices in Camden, looked at the role of challenge and intuition in learning. We wanted to explore the differences between the field of user experience (UX), where in many cases there is a desire to make an experience frictionless, easy, smooth, and LX, where challenge and struggle have an essential, beneficial role in the process. We heard from three people from wildly different teaching backgrounds and contexts about the role of challenge in the work they do. The consensus from the group afterwards was about just how much we benefit we can get from different people’s context and perspectives. We saw just how much benefit we lose when we only club together in tight communities of practice where practitioners have the same roles. It seems like the obvious thing to do but we all reinforce our approaches. There’s a huge amount we benefit from the dialogue, even if at first it might seem so different that there isn’t much overlap in the LX work that we do. During the meetups, and in the feedback that we get from people after, we see that this title and field really resonate with people working in a wide range of educational contexts. An attendee of the first event said that she always found it so hard to describe her job to people she met, but that Learner Experience Designer might just make that conversation a little bit easier. Since we started we have met people that previously described themselves in this way as well as people who are getting more comfortable with the idea. We’ve also seen actual job titles with learner experience in them and a general feeling that this is a field that we can all benefit from. We even had two people travel down to London from Sheffield for the last event! Another thing that has become clear is the importance of the actual experience of the event. Each time we have used a different venue and come up with a different format. The most recent event, at Government Digital Service in Whitechapel, was all about co-creation, with attendees forming into groups to come design a programme of study for a specific group of learners in a context. 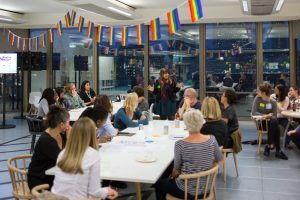 This was completely different to the second meetup, where we had a more traditional 3 speaker plus format, but with activities for people to do before and after hearing the speakers’ perspectives. At the first event we sat on sofas, in the most recent all around tables. At the first we ate bagels, since then it’s been cheese, quiche and biscuits! What we have seen is that people enjoy the variety and this is keeping us on our toes in terms of the LX of the event itself. We’ve learned that LX should be flexible and be based on the feedback from the learners. The next LXD Meetup is on Tuesday 28th November, where we’ll tackle the thorny issue of motivation: How can we use design to help learners want to learn, both within the boundaries of specific learning experiences – and across the course of their lifetimes? What’s the relationship between external and internal motivators and is motivation ever truly intrinsic? You can sign up here. If you would like to get involved, we are always interested in hearing from people with access to a space that could host us for an evening. And if you have an idea for a theme that we should discuss in more detail, or would like to speak at an LXD Meetup, please let us know.